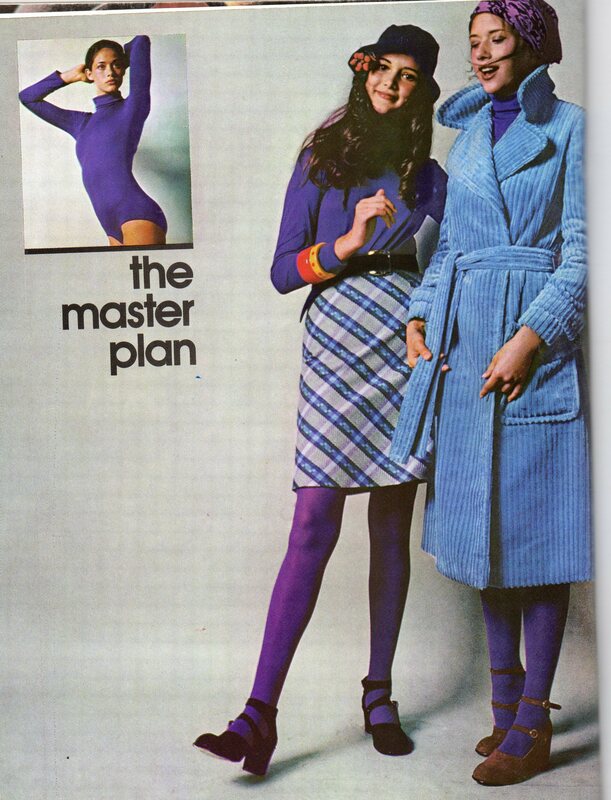 Welcome Dear Readers to the world of the Slightly Creepy Seventies where we trip down memory lane by revisiting the pages of old magazines from the inexplicable decade of the 70’s. Published during the great capitalized letter shortage of 1975. Let’s open to the first page. Oh look! It’s some actual Slightly Creepy Seventies Teens! As you can see, all teenage girls in the Slightly Creepy Seventies look like they are between the ages of 35 and 40. There are three theories for this: 1) The ugliness of the seventies was more aging to the skin than the rays of the Slightly Creepy Seventies Sun 2) wearing stupid outfits you sewed yourself altered the chemical structure of your DNA (not in a good way) or 3) all teenage girls in the Slightly Creepy Seventies actually were between the ages of 35 and 40. *Note the little boy in the striped, home-sewn whatevers is keeping a low profile. It seems one of the teenagers between 35 and 40 has started a family unbeknownst to mom. Sh . . .I won’t tell if you won’t. Well okay then! And what better way to do that than to sew yourself a bathrobe and wear it out in public. Oh and don’t forget that really good friend with the cheerfully sympathetic expression to walk along beside you with her hand on your back like she’s guiding you as you schlep from place to place. That way people who don’t understand your never-can-be-duplicated specialness, will just have to assume you’ve recently gone blind and haven’t figured out a workable system, as yet, for getting dressed in the dark. Either way it’s a slightly creepy seventies win/win! 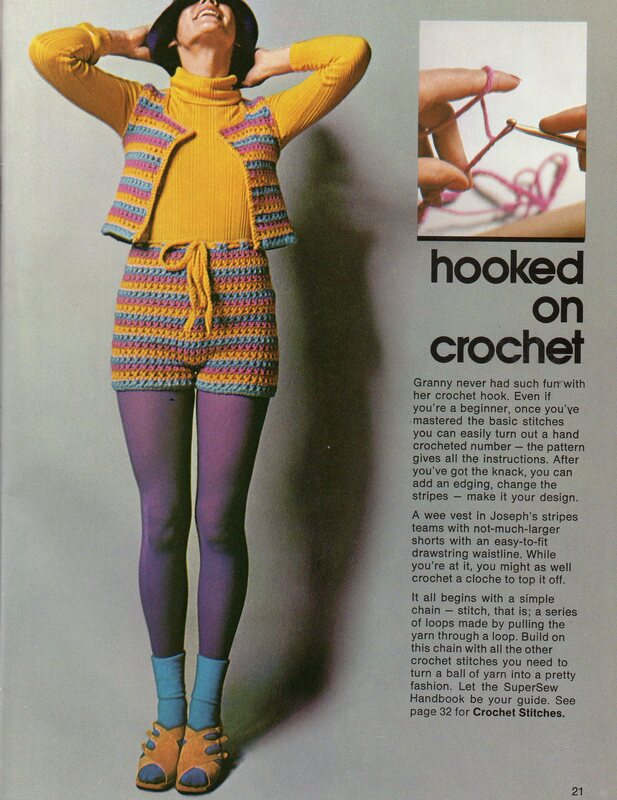 In a decade where everybody started their day out by brushing their teeth with cocaine, gargling with LSD and using a Mescaline moisturizer, what most people don’t realize is that it was actually crochet addiction that was responsible for ruining more 1970’s wardrobes than cocaine, LSD and Mescaline combined! Sure, this slightly creepy seventies teen looks 45 but that’s only by today’s standards. Back in the Slightly Creepy Seventies she didn’t look a day over 13! Why? Because she’s wearing a shirt with an arrow appliqued on it that’s why! An arrow that proclaimed to the world, “Yes! I have an arrow on my shirt, so? You got a problem with that? Get over it Mom! Get over it Dad! Get over it establishment!” Right after this she went down and signed up for a fake senior discount card! In your face boss man. You go teenage girl who looks 45! Uh Oh . . . Crochet Addiction Rears it’s Ugly Head Again! Uh Oh . . . It looks like this Slightly Creepy Seventies slumber party where everyone sewed themselves a nightgown has taken a turn for the worse. Obviously Jessica and Jessica are suffering mightily from crochet addiction withdrawals and are engaged in a fight to the death for the last ball of granny’s yarn. It’s an ugly reality that was often swept under even uglier crocheted rugs all over Slightly Creepy Seventies America. But then would we expect any less from the Slightly Creepy Sevenites? And there you have it, Dear Readers, this edition of the Slightly Creepy Seventies. But remember, even though it is now 2015 — if someone invites you to try crocheting? Better stay on the safe side and just say no! I can’t believe you’re mocking the crocheted ashtry I made for my parents in the second grade, to say nothing of my classic handmade hemp pajamas, in brown AND burnt orange! So you were a Slightly Creepy Seventies crocheting fool! A child prodigy no less! !I always suspected as much Guap. Which is of course why you are one of my favorite SSS People! 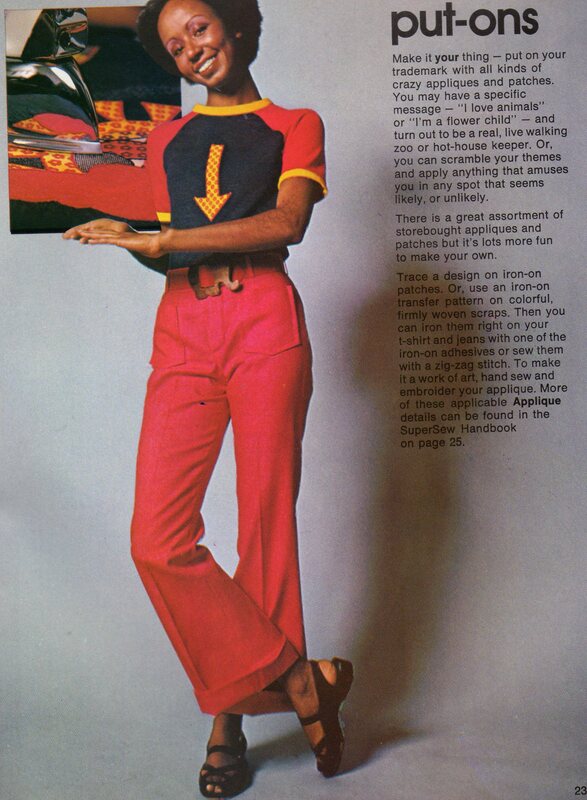 Looks like the slightly creepy 70’s teen in the blue blouse in the first photo forgot to sew herself some pants to go with the blouse. Also, I don’t think the last photo is so much slumber party gone wrong but rather affirmation that, in the 70’s, everybody really was Kung Fu Fighting. Ha! I bet you’re right. Everybody really was Kung Fu Fighting. That’s probably how the girl in the first picture lost her pants! Boy, you must feel MUCH better now! Quite an outburst, though, do you really think it kind to make fun of those poor models? It must have been hard to find work back then for middle aged models who look like they’re in recovery from a severe crochet addiction…. It sure feels good to poke at the mundanes, doesn’t it? 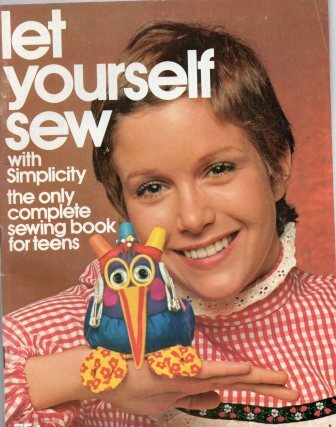 Sadly, I was a crochet-addicted, sewing-afflicted, young mom. My poor son was forced to wear home made plaid suits but did not complain about the snuggle baby blankets or hats and scarves. Nicely done! In 1976, my aunt knitted me a beige crew neck pullover. I hated it. So, I put my legs through the arms and pulled it up like a pair of trousers. For one day, I went round pretending I was an over-worked battery hen. I still find it hard to hold down a proper job. LOL! That must have been one hell of a sweater! It appears the entire decade was creepy. I always wanted to knit me a river–much less stressful than crying one. Wow! Crocheted shortie pajamas, and a big fat corduroy bathrobe!! My mind’s workin’ overtime, tryna picture Al Gore in that outfit!! He would, of course, be wearing the shortie pajamas on the outside! !